We report a solution-based method to synthesize substrate-bound Au nanowires. By tuning the molecular ligands used during the synthesis, the Au nanowires can be grown from various substrates with different surface properties. Au nanowire-based nanostructures can also be synthesized by adjusting the reaction parameters. Wang, X., Wu, X., He, J., Tao, X., Li, H., Zhao, G., Wang, Y., Chen, H. Synthesis of Substrate-Bound Au Nanowires Via an Active Surface Growth Mechanism. J. Vis. Exp. (137), e57808, doi:10.3791/57808 (2018). Advancing synthetic capabilities is important for the development of nanoscience and nanotechnology. The synthesis of nanowires has always been a challenge, as it requires asymmetric growth of symmetric crystals. Here, we report a distinctive synthesis of substrate-bound Au nanowires. This template-free synthesis employs thiolated ligands and substrate adsorption to achieve the continuous asymmetric deposition of Au in solution at ambient conditions. The thiolated ligand prevented the Au deposition on the exposed surface of the seeds, so the Au deposition only occurs at the interface between the Au seeds and the substrate. The side of the newly deposited Au nanowires is immediately covered with the thiolated ligand, while the bottom facing the substrate remains ligand-free and active for the next round of Au deposition. We further demonstrate that this Au nanowire growth can be induced on various substrates, and different thiolated ligands can be used to regulate the surface chemistry of the nanowires. The diameter of the nanowires can also be controlled with mixed ligands, in which another "bad" ligand could turn on the lateral growth. With the understanding of the mechanism, Au nanowire-based nanostructures can be designed and synthesized. Typical of one dimensional nanomaterials, nanowires possess both the bulk-related properties and the unique properties originated from the quantum effects of the nanoscale structure. As a bridge between the nanoscale and the bulk scale materials, they have been widely applied in various fields of catalysis, sensing, and nanoelectronic devices, etc.1,2,3. However, the synthesis of nanowires has long been a great challenge, as it usually requires breaking the intrinsic symmetry in the crystals. Traditionally, a template is employed to regulate the deposition of materials. For instance, template-electrodeposition has been used for the formation of various types of nanowires like Ag nanowires and CdS nanowires4,5,6,7,8,9,10. Another common approach is vapor-liquid-solid (VLS) growth, which employs a molten catalyst to induce the anisotropic growth on the substrate at an elevated temperature11. Common strategies for the synthesis of metal nanowires are the polyol methods for Ag nanowires and the oleylamine-assisted ultrathin Au nanowires12,13,14,15. Both approaches are material-specific, and the nanowire parameters are not readily tuned during the synthesis. In addition, metal nanowires can also be formed by the pressure-driven method, where the assembled metal nanoparticles are mechanically compressed and fused into nanowires16,17,18. Recently, we reported a distinctive method to synthesis Au nanowires19. With the assist of a thiolated small molecule ligand, the nanowires could grow and form a vertically aligned array on the bulk Si wafer substrate at ambient conditions. It was found that the ligands play an important role in the symmetry-breaking growth. It binds to the surface of the substrate-adsorbed Au seeds strongly, forcing the Au to deposit selectively at the ligand-deficient interface between seeds and substrate. The interface between the newly deposited Au and the substrate remains ligand deficient, therefore, the active surface exists throughout the whole growth. By tuning the ligand concentration, the seed type and concentration as well as several other parameters, a series of Au nanowire-based nanostructures could be synthesized. In this work, we will provide a detailed protocol for this convenient Au nanowires synthesis. The derived synthesis is also presented, including the synthesis of Au nanowires with hydrophobic surface property, Au nanowires on other substrates, tapered Au nanowires by mixing two ligands and the nanowire-based Au nanostructures formed by tuning the growth conditions. Caution: Please check the material safety data sheets (MSDS) of the chemicals for detailed handling and storage instruction. Please be careful while handling the nanomaterials, as there may be unidentified risk. Please perform the experiments in a fume hood and wear appropriate personal protective equipment. Note: To avoid failure caused by the premature nucleation during the nanoparticle synthesis, wash the glassware and stir bar used in the synthesis with aqua regia and rinse thoroughly with water. Prepare a hydrogen tetrachloroaurate (III) (HAuCl4) solution by dissolving 10 mg of HAuCl4∙3H2O in 1 mL of deionization water (DI water) in a 4 mL vial. Pipette 0.197 mL of the HAuCl4 solution into a 50 mL round-bottom flask. Add 19.7 mL of DI water to the flask to dilute the HAuCl4 solution. Dissolve 10 mg of sodium citrate in 1 mL of DI water in another 4 mL vial to prepare a 1% sodium citrate stock solution. Add 0.147 mL of the 1% sodium citrate solution to the diluted HAuCl4 solution prepared in step 1.1.2. Prepare a 0.1 M sodium borohydride (NaBH4) solution by dissolving 2.3 mg of NaBH4 in 0.6 mL of DI water. Quickly inject 0.6 mL of 0.1 M NaBH4 solution into the mixture from step 1.1.3 under vigorous stirring. Check for an immediate color change of the solution from pale yellow to bright orange. Stir the mixture for another 10 min. Wait for a gradual color change of the solution to reddish orange. Confirm the size of the obtained Au nanoparticles with UV-Vis spectroscopy and scanning electron microscopy (SEM). Add 100 mL of DI water in a 250 mL round-bottom flask. Weigh 10 mg of HAuCl4∙3H2O solid and dissolve it in the round-bottom flask. Add a magnetic stir bar into the flask and equip the flask with a condenser. Stir and heat the solution prepared in 1.2.1 to 100 °C in an oil bath. Reflux the solution for 10 min. Weigh 40 mg of sodium citrate and dissolve it in 4 mL of DI water to prepare a 1% sodium citrate stock solution. To synthesize 15 nm Au nanoparticles, add 3 mL of the 1% sodium citrate solution from step 1.2.3 to the boiled mixture with a syringe. Note: The color of the solution turns gray in 1 min, and then gradually to red. To synthesize 40 nm Au nanoparticles, inject 1.5 mL of the 1% sodium citrate solution to the boiling solution from step 1.2.2 with a syringe. Keep the solution boiling until it changes to red in about 10 min. Note: The color of the solution changes from transparent to dark gray, then to black, and finally to purple in about 1 min. Continue to reflux the reaction solution for 30 min. Cool down the solution to room temperature at ambient conditions. Characterize the size and uniformity of the resulting Au nanoparticles with UV-Vis spectroscopy and SEM. Prepare the substrate for seed adsorption. Cut the Si wafer into 5 mm ´ 5 mm pieces. Clean the Si wafer pieces with DI water and ethanol sequentially in an ultrasonic bath, each for 15 min. Treat the Si wafer with 29.6 W of O2 plasma (operated at 220 V) for 20 min. Note: The surface of the wafer becomes hydrophilic. Prepare a 5 mM 3-aminopropyltriethoxysilane (APTES) solution by dissolving 11.1 mg of APTES to a mixture of DI water (5 mL) and ethanol (5 mL) in a 20 mL vial. Soak a piece of Si wafer in the APTES solution prepared in step 2.1.3 in a 20 mL vial for 30 min. Take out the Si wafer and wash it thoroughly with ethanol and DI water. Adsorb seed nanoparticles onto the substrate. Soak the Si wafer in the 3-5 nm Au seeds solution prepared in step 1.1 for 2 h.
To grow Au nanowires from 15 nm Au seeds, soak the Si wafer in the 15 nm Au nanoparticle solution for 2 h.
To grow Au nanowires from 40 nm Au seeds, soak the Si wafer in the 40 nm Au nanoparticle solution for 2 h.
Take out the Si wafer and wash it with 50 mL of DI water to remove unabsorbed Au nanoparticles. Grow the substrate-bound Au nanowires. Prepare a 1.65 mM 4-mercaptobenzoic acid (4-MBA) solution by dissolving 2.5 mg of 4-MBA in 10 mL of ethanol. Prepare a 5.10 mM HAuCl4 solution by dissolving 20.1 mg of HAuCl4∙3H2O in a mixture of 5 mL of ethanol and 5 mL of DI water. Prepare a 12.3 mM L-ascorbic acid solution by dissolving 21.7 mg of L-ascorbic acid in 10 mL of DI water. Mix 0.5 mL of 5.10 mM HAuCl4 solution with 0.5 mL of 1.65 mM 4-MBA solution in a 10 mL vial. Soak the seed-adsorbed Si wafer from step 2.2.2 in the mixed solution prepared in step 2.3.4. Add 0.5 mL of 12.3 mM L-ascorbic acid solution into the wafer-soaked mixed solution. Shake the vial gently to evenly mix the solution. Leave the wafer and the solution undisturbed for 15 min. Check the bubble formation during the growth process, and the color change of the surface of the Si wafer from shiny gray to reddish brown. Take out the Si wafer and rinse it with ethanol and DI water. Dry the Si wafer at ambient conditions and wait for the surface of the wafer to turn to gold. Characterize the morphology of the Au nanowires with the SEM. For growth of Au nanowires on a glass slide, Al2O3, SrTiO3, LaAlO3, indium tin oxide (ITO) and F-doped tin oxide (FTO) substrates, follow the same procedures, including the cleaning processes. Synthesis of Au nanowire forests with various thiolated ligands: 2-naphthalenethiol (2-NpSH), 4-mercaptophenylacetic acid (4-MPAA) and 3-mercaptobenzoic acid (3-MBA). Treat the Si wafer following the same procedures in steps 2.1-2.2. Prepare a 1.65 mM 2-NpSH solution by dissolving 2.6 mg of 2-NpSH in 10 mL of ethanol. Prepare a 1.65 mM 4-MPAA solution by dissolving 2.8 mg of 4-MPAA in 10 mL of ethanol. Prepare a 1.65 mM 3-MBA solution by dissolving 2.5 mg of 3-MBA in 10 mL of ethanol. Prepare the 5.10 mM HAuCl4 solution and 12.3 mM L-ascorbic acid solution following the same procedure in steps 2.3.1-2.3.3. In a 10 mL vial, mix 0.5 mL of the HAuCl4 solution with 0.5 mL of 2-NpSH solution, and shake the mixture to get a homogeneous solution. In a 10 mL vial, mix 0.5 mL of the HAuCl4 solution with 0.5 mL of 4-MPAA solution, and shake the mixture to get a homogeneous solution. In a 10 mL vial, mix 0.5 mL of the HAuCl4 solution with 0.5 mL of 3-MBA solution, and shake the mixture to get a homogeneous solution. Add 0.5 mL of 12.3 mM L-ascorbic acid solution to the wafer-soaked mixed solution. Shake the vial gently to get an evenly mixed solution. Leave the wafer and the solution undisturbed for 15 min. Observe the surface of the Si wafer turning slowly from shiny gray to reddish brown. Take out the Si wafer and rinse it with ethanol and DI water, and dry the Si wafer at ambient conditions until the surface of the wafer turns to gold. Confirm the Au nanowires forest structure with SEM. Synthesis of tapered Au nanowires with mixed ligands. Synthesis of thickened Au nanowires with mixed ligands of 4-MBA and 3-mercaptopropanoic acid (3-MPA) (c4-MBA/c3-MPA = 3:1). Treat the Si wafer following the same procedures in steps 2.1-2.2, except dilute the seed solution 100 times. Prepare a 3 mM 4-MBA solution by dissolving 4.6 mg of 4-MBA in 10 mL of ethanol. Prepare a 3 mM 3-MPA solution by dissolving 3.2 mg of 3-MPA in 10 mL of ethanol. Mix 0.75 mL of 3 mM 4-MBA solution with 0.25 mL of 3 mM 3-MPA solution (in a 10 mL vial. Shake gently to get a homogeneous solution. Prepare the 5.10 mM HAuCl4 solution and 12.3 mM L-ascorbic acid solution following the same procedure in steps 2.3.2-2.3.3. Add 0.5 mL of 5.10 mM HAuCl4 solution to the mixed solution in step 3.2.1.4 and shake gently to homogenize the solution. Soak the Si wafer from step 3.2.1.1 in the mixed solution in a 10 mL vial. Add 0.5 mL of 12.3 mM L-ascorbic acid solution to the mixed solution. After 10 min, take the Si wafer out and rinse with ethanol and DI water. Dry the wafer at ambient conditions and confirm the structure by SEM. Synthesize tapered Au nanowires with mixed ligand of 4-MBA and 3-MPA (c4-MBA/c3-MPA = 6:4). Follow the same procedures in step 3.2.1 with 0.6 mL of 3 mM 4-MBA solution and 0.4 mL of 3 mM 3-MPA solution instead. Synthesize tapered Au nanowires with mixed ligands of 4-MBA and 3-MPA (c4-MBA/c3-MPA = 1:1). Follow the same procedures in step 3.2.1 with 0.5 mL of 3 mM 4-MBA solution and 0.5 mL of 3 mM 3-MPA solution instead. Synthesis of segmental Au nanowires with thick-thin-thick-thin segments. Prepare a 1.65 mM 4-MBA solution by dissolving 2.5 mg of 4-MBA in 10 mL of ethanol. Prepare a 0.0830 mM 4-MBA solution by diluting the 1.65 mM 4-MBA solution 20 times. Prepare the HAuCl4 and L-ascorbic acid solution following the same procedures in steps 2.3.2-2.3.3. Prepare 1.5 mL of growth solution A by mixing 0.5 mL of 1.65 mM 4-MBA solution, 0.5 mL of 5.10 mM HAuCl4 solution, and 0.5 mL of 12.3 mM L-ascorbic acid solution (the final concentration: c4-MBA = 0.550 mM, cHAuCl4 = 1.70 mM, cL-ascorbic acid = 4.10 mM). Prepare 1.5 mL of growth solution B by mixing 0.5 mL of 0.0830 mM 4-MBA solution, 0.5 mL of 5.10 mM HAuCl4 solution, 0.5 mL of 12.3 mM L-ascorbic acid solution (the final concentration: c4-MBA = 0.0280 mM, cHAuCl4 = 1.70 mM, cL-ascorbic acid = 4.10 mM). Immerse the Si wafer in a 10 mL vial containing growth solution B for about 1 min. Rapidly transfer the Si wafer without drying to another 10 mL vial containing growth solution A and leave it to grow for 2 min. Repeat steps 4.1.7-4.1.8 one more time. Take the Si wafer out and rinse with 50 mL of ethanol and 50 mL of DI water. Confirm the structure of the resulting segmented Au nanowires by SEM. Treat the Si wafer following the same procedures in steps 2.1-2.2, except with a 5 min O2 plasma treatment. Soak the Si wafer in a 10 mL vial containing a 10000x diluted 3-5 nm Au seeds solution for 15 min. Wash the Si wafer from step 4.2.2 thoroughly with DI water to remove unabsorbed Au nanoparticles. Prepare a growth solution containing 0.550 mM 4-MBA, 1.70 mM HAuCl4, and 4.10 mM L-ascorbic-acid, following the same procedures in step 4.1.5. Soak the wafer in a 10 mL vial containing the growth solution for 30 s.
Remove the wafer from the growth solution and leave a thin layer of the solution (~ 13- 15 μL) on the wafer. Quickly blow-dry the wafer at room temperature. Confirm the nanoflower structure by SEM. The Au nanoparticle seeds, substrate-bound Au nanowires and Au nanowire-based derivative nanostructures are characterized with SEM. 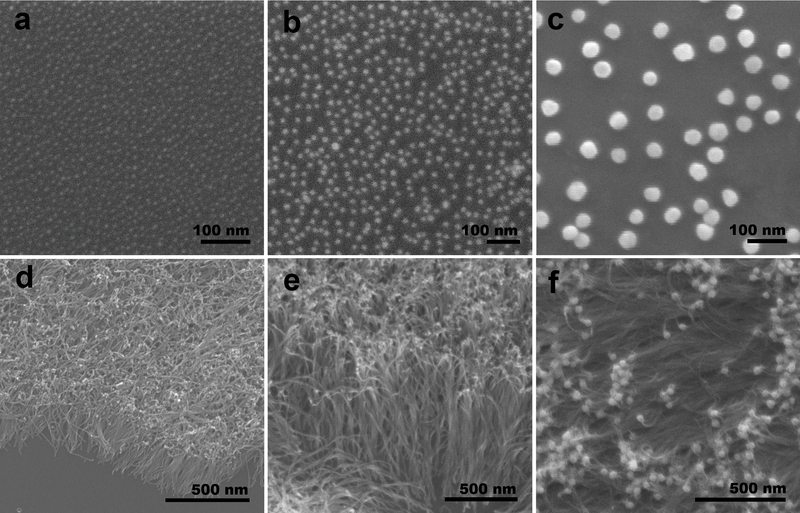 Figure 1 shows the representative SEM images of the 3-5 nm Au nanoparticles, 15 nm Au Nanoparticles and 40 nm Au nanoparticles adsorbed on the Si wafer, confirming their sizes, adsorption and distribution. The Au nanowires grown from the respective seeds on the Si wafer substrate are also presented. The representative SEM images of the typical Au nanowires substrates other than the wafer substrate, i.e., glass substrate, etc. are presented in Figure 2. The representative SEM images of the thickened nanowires synthesized with various ligands and mixed ligands are presented in Figure 3. 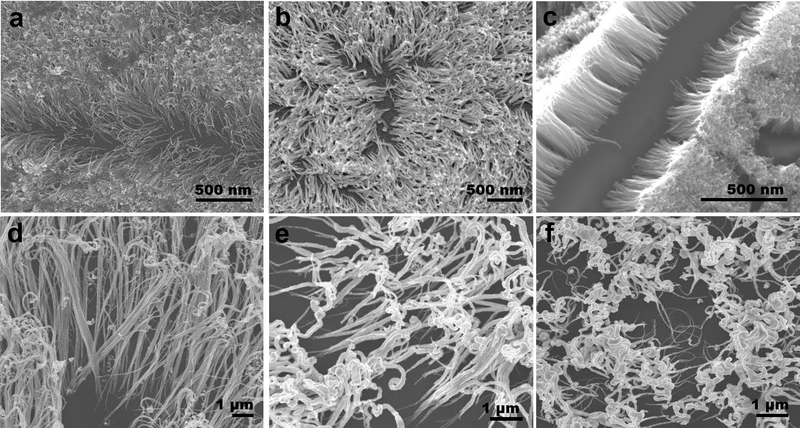 The representative SEM images of the segmental nanowires and nanoflower structure are presented in Figure 4. Figure 1: SEM images of the Au nanoparticle seeds before nanowire growth: (a) 3-5 nm, (b) 15 nm, and (c) 40 nm Au nanoparticles. Au nanowires grown from the (d) 3-5 nm, (e) 15 nm and (f) 40 nm seeds on wafer substrate. Please click here to view a larger version of this figure. Figure 2: SEM images of the Au nanowires grown on substrate other than Si wafer. Nanowires grown from: (a) Al2O3, (b) SrTiO3, (c) LaAlO3 (d) glass slide, (e) ITO and (f) FTO substrates. Please click here to view a larger version of this figure. Figure 3: SEM images of the synthesized with other ligands. Ultrathin nanowire arrays formed with (a) MPAA, (b) 2-Naphthalenethiol, (c) 3-MBA ligands. Tapered Au nanowires formed with mixed ligands of 4-MBA and 3-MPA: (d) c4-MBA : c3-MPA = 3 : 1, (e) c4-MBA : c3-MPA = 6 : 4 and (f) c4-MBA : c3-MPA = 1 : 1. Please click here to view a larger version of this figure. Figure 4: SEM images of complex Au NW-based nanostructures. (a) Segmental nanowire with thick-thin-thick-thin segments; (b) nanoflowers by drying the growth solution on the substrate. Please click here to view a larger version of this figure. The mechanism of this active surface growth governed nanowire synthesis has been discussed comprehensively in previous work19. In addition, the effects of seed sizes and types as well as the effect of ligand types and sizes have also been investigated20,21. Generally. the nanowire growth is very different from previous reported routes. No template is required, and the asymmetric growth is induced by the differences between the ligand-capped Au surface and the Au surfaces facing the substrate. The active surface remains active throughout the whole growth process, since the newly deposited Au surface is always fresh and ligand-deficient. Here we would concentrate our discussion on the experimental operation in performing this synthesis. The reaction takes place under ambient condition; nevertheless, a few points still need to be emphasized for better control in synthesizing these nanostructures. The synthesis of the Au nanowires begins with the preparation of seed nanoparticles. Generally, any Au nanostructures can be employed as the seed for growing nanowires. However, the density of the seeds on the substrate is important for the following Au deposition and nanowire growth process. The seed density decides the density of active site, where the Au would deposit onto. If the concentrations of the ligand, HAuCl4 and L-ascorbic acid are kept constant, the amount of Au get reduced per unit time would stay the same. As a result, the Au nanowire grown on each active site would be much faster and the obtained nanowires would be longer if the density of the seed decreases. Another possible scenario would be the appearance and expansion of the Au nanowire bundles, since too much Au deposition at one active site would cause expansion and split the active surface. The density of the seed on the substrate could be controlled by two means: the seed incubation time and the concentration of the seed solution used to incubate the substrate. It is worth mentioning that the concentrations of each Au nanoparticles solution described here are not the same, and the difference could be in orders of magnitude. Therefore, the concentration of the seed solution sometimes would be necessary. As shown in the representative result comparing the 3-5 nm and 15 nm Au nanoparticles, the Au nanowire grown from the non-concentrated 40 nm Au nanoparticles is much longer, and forms bundles. On the other hand, the seed density is purposely reduced when preparing the thick nanowires with mixed ligands. This is to avoid the fusion of the nanowires, as the lateral growth during the thick nanowire growth happens simultaneously with the longitudinal elongation. Dense seed adsorption would lead to fusion of the Au seeds to a continuous Au film at the very beginning stage, preventing the further nanowire growth. The substrate adsorption of the seed is important for creating a systematic asymmetry on the Au seed surface. We use the amine-contained siloxane to achieve the attachment of the Au seeds. It is normally accepted that the Au seeds are adsorbed by the electrostatic interaction between the amine group and the nanoparticle surface22. In some cases where the seed particles are positively charged, the cast and dry method could also be employed. The APTES is linked to the wafer and glass chip surface through the Si-O bond after hydrolyzing in the water/ethanol solution. Theoretically, any surface that could condense with the APTES would be able to facilitate the growth of Au nanowires. In this work, we demonstrate this with several oxide surfaces. An O2 plasma treatment is necessary to partially oxidize the substrate surface and implant the -OH group that could condense with the APTES. The O2 plasma treatment is chosen due to its clean and simple operation procedure; otherwise, piranha solution could also be used to create the -OH groups. Another key point for the substrate preparation is that the surface concentration of the -NH2 may also have a significant effect on the seed adsorption. Although we could not directly characterize the result of the surface treatment, the operation procedure should be done as precisely as possible. The washing of the substrate after each step is sometimes crucial, especially after the APTES treatment. The free APTES molecule could also adsorb on the Au nanoparticles surface. Without a thorough wash, the seed solution would aggregate significantly during the soaking process. The aggregated seeds can still adsorb on the substrate and induce the Au nanowire growth. However, since aggregation would greatly reduce the concentration of the seeds, the density of the active sites also decreases exponentially. As a result, the top of the final nanowires area would be the Au nanoparticle agglomerates, and the nanowires become spared bundles instead of forest. Typical Au nanowire growth takes place in a mixed solvent of the water and ethanol (v/v = 1:1). Since the ligand 4-MBA is not soluble in ethanol, it should first be dissolved in the ethanol solution, and then mixed with the result of the growth solution. Apart from the solubility issue, the solvent ratio itself also plays significant role deciding the nanowire growth. The area of the active surface is decided by the ligand adsorption ratio and the deposition rate of Au. The reduction ability of the L-ascorbic acid varies in different solvents and at different pH environments23. Changing the solvent ratio would change the rate of Au reduction and deposition immediately. Increasing the water ratio too much could result in rapid Au reduction and possible homogeneous nucleation, which prevents the growth of the substrate-bound Au nanowires. Similar to the solvent ratio, the concentration of the ligands also directly affects the nanowire formation, as it not only passivates the Au surface, but also stabilizes the Au and prevents homogeneous nucleation. An excess amount of ligand would greatly slow down the Au reduction. For instance, increasing the ligand concentration 5 times to 2.5 mM would result in no Au deposition on the substrate21. Decreasing the ligand concentration will cause the increase in the nanowire diameter and sometimes homogeneous nucleation, the latter one signified by the change of solution from colorless to greyish or reddish. The homogeneous nucleation would compete with the heterogeneous Au nanowire growth for the Au feedstock. Depending on the degree of homogeneous nucleation, the Au nanowire growth might be completely or partially shut off by the lack of Au feeding stock. In conclusion, we demonstrate a novel method to prepare substrate-bound Au nanowires on different substrates. The Au nanowires form an array on the flat substrate surface. The width, length and density are readily tuned by changing the reaction parameters. The surface chemistry of the nanowires can be adjusted by the ligands, and thickened nanowires could be formed by mixing two different types of ligands. Furthermore, Au nanowires-derived complex Au nanostructures could be formed by combining several different growth conditions. We gratefully acknowledge the financial support from National Natural Science Foundation of China (21703104), Jiangsu Science and Technology Plan (SBK2017041514) Nanjing Tech University (39837131), and SICAM Fellowship from Jiangsu National Synergetic Innovation Center for Advanced Materials. Yao, S. Z., et al. A Compartment-less Nonenzymatic Glucose-air Fuel Cell with Nitrogen-doped Mesoporous Carbons and Au Nanowires as Catalysts. Energy & Environmental Science. 6, 3600-3604 (2013). Gu, H. W., et al. Highly Efficient Synthesis of N-Substituted Isoindolinones and Phthalazinones Using Pt Nanowires as Catalysts. Organic Letters. 14, 1876-1879 (2012). Patolsky, F., et al. Nanowire-based Nanoelectronic Devices in the Life sciences. MRS Bulletin. 32, 142-149 (2007). Schwarzacher, W., et al. 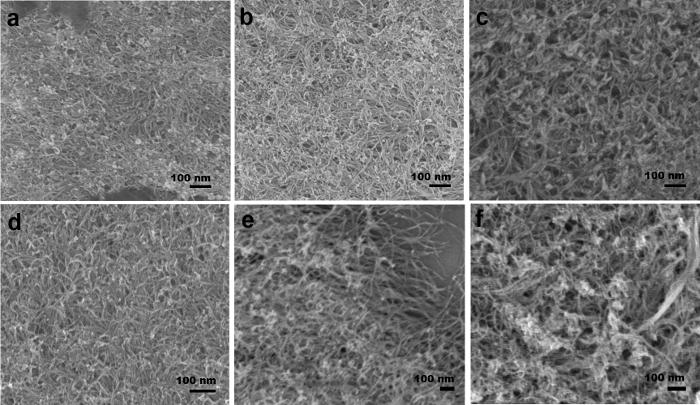 Templated Electrodeposition of Silver Nanowires in a Nanoporous Polycarbonate Membrane from a Nonaqueous Ionic Liquid Electrolyte. Applied Physics A-Mater. 86, 373-375 (2007). Song, L. X., et al. Template-Electrodeposition Preparation and Structural Properties of CdS Nanowire Arrays. Microelectronic Engineering. 83, 1971-1974 (2006). Song, J., et al. A New Twist on Nanowire Formation: Screw-Dislocation-Driven Growth of Nanowires and Nanotubes. Journal of Physical Chemistry Letters. 1, 1472-1480 (2010). Lim, S. K., et al. Controlled Modulation of Diameter and Composition along Individual III-V Nitride Nanowires. Nano Letters. 13, 331-336 (2012). Xu, J. M., et al. Electrochemical Fabrication of CdS Nanowire Arrays in Porous Anodic Aluminum Oxide Templates. Journal of Physical Chemistry. 33, 14037-14047 (1996). Lee, S. T., et al. High-density, Ordered Ultraviolet Light-emitting ZnO Nanowire Arrays. Advanced Materials. 15, 838-841 (2003). Tang, Y. Q., et al. Electrochemically Induced Sol-Gel Preparation of Single-Crystalline TiO2 Nanowires. Nano Letters. 2, 717-720 (2002). Yang, H. J., et al. Vapor-liquid-solid Growth of Silicon Nanowires Using Organosilane as Precursor. Chemical Communications. 46, 6105-6107 (2010). Xia, Y. N., et al. Ultrathin Gold Nanowires Can Be Obtained by Reducing Polymeric Strands of Oleylamine−AuCl Complexes Formed via Aurophilic Interaction. Journal of the American Chemical Society. 130, 8900-8901 (2008). Miguel, J. Y., et al. Helical Growth of Ultrathin Gold-Copper Nanowires. Nano Letters. 16, 1568-1573 (2016). Sun, S. H., et al. Ultrathin Au Nanowires and Their Transport Properties. Journal of the American Chemical Society. 130, 8902-8903 (2008). Sun, S. H., et al. Growth of Au Nanowires at the Interface of Air/Water. Journal of Physical Chemistry. C. 113, 15196-15200 (2009). Wu, H. M., et al. Nanostructured Gold Architectures Formed through High Pressure-Driven Sintering of Spherical Nanoparticle Arrays. Journal of the American Chemical Society. 132, 12826-12828 (2010). Wu, H. M., et al. Pressure-Driven Assembly of Spherical Nanoparticles and Formation of 1D-Nanostructure Arrays. Angewandte Chemie International Edition. 7, 8431-8434 (2010). Li, B. S., et al. Stress-induced Phase Transformation and Optical Coupling of Silver Nanoparticle Superlattices into Mechanically Stable Nanowires. Nature Communications. 5, 4179 (2014). Chen, H. Y., et al. Forest of Gold Nanowires: A New Type of Nanocrystal Growth. ACS Nano. 7, 2733-2740 (2013). Wang, Y. W., et al. Exploiting Rayleigh Instability in Creating Parallel Au Nanowires with Exotic Arrangements. Small. 12, 930-938 (2016). Wang, Y. W., et al. Effect of Thiolated Ligands in Au Nanowires Synthesis. Small. 13, 1702121 (2017). Gedanken, A., et al. The surface chemistry of Au colloids and their interactions with functional amino acids. Journal of Physical Chemistry B. 108, 4046-4052 (2004). Xia, Y. N., et al. Shape-Controlled Synthesis of Pd Nanocrystals in Aqueous Solutions. Advanced Functional Materials. 19, 189-200 (2009).